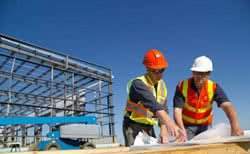 Lean construction (LC) is a method of production aimed at reducing costs, materials, time and effort. Essentially, the methodology is to minimize the bad and maximize the good. Using the principles of lean-construction, the desired outcome would be to maximize the value and output of a project while minimizing wasteful aspects and time delay. This outcome is produced when standard construction approaches are merged with a clear and concise understanding of project materials and information and two sets of management archetypes, planning and control. This may seem complex to understand, but the essence of this system to use what is necessary without extra. This can only be done by strategic planning and action by a management group and with the help and aid of all workers. It should be understood that lean construction is a philosophy with principles and ideologies, but it is not a concrete plan of action with set tools and methods. LC principles are the same throughout the many different schools of thought. The basic principles include: creating a predictable atmosphere based on planning and data, reducing the overflow of waste from careful planning and increasing the communication flows between the customer and the project at hand. Lean is a way of thought based on the notion that less is more. In the following sections hopefully a clear understanding of the principles and practices of the lean mindset are clearly expressed. Using fewer materials and having less waste can greatly reduce all around costs. Although the philosophy of lean construction is focused on overall reduction, not just for profit, utilizing this methodology has shown to increase the bottom line. Construction time can greatly be reduced by increased planning and strategic vision. Fewer accidents and a higher rate of safety through increased worker focus and understanding. Increased schedule reliability and predictability. Improved overall results due to increased communication and fewer workers. Decreased stress for workers and management due to fewer workers. Increased productivity all around due to a higher rate of planning. Increased profits and turnovers, with increased customer satisfaction. Increased job satisfaction resulting in more performance commitment. In order for this method of construction to be effective, all areas of management, along with the workers, have to be in accordance with the plan. If there is a break in the chain, the lean methodology cannot work. Getting everyone onboard with a new production method isn’t easy, and some people may be ambivalent about change. In order for successful implementation, management officials must be able to guide employees directly and efficiently. In essence, the lean method of operation is derived by how well a management official can work with his employees more so than with the standard procedure, and personality clashes, as well as other issues may arise. Training and educating employees in the lean method takes time and dedication, and as expressed earlier, some workers may not like or deal well with change. Staying on course with a new system of operation can be difficult for some managers, and some may grow frustrated. Cohesive teamwork is essential for lean production. Each worker has to be well versed in his position or a breakdown will occur as all workers rely on one another. Training employees with a new system can take some time, and this could decrease the overall time on a project or design. Management has to be astute to all production issues as a breakdown in the system can easily occur. Staying alert to the change in operations can be hard for all employees. Suppliers and distributors have to be notified of the change in production, and this could cause problems. A temporary decrease in employee morale might be noticed due to the change in policy. A project managed under the standardized view of construction versus that managed using the lean philosophy is greatly different. From the beginning of the project to the end goal, every area is drastically changed. One of the biggest differences is derived from the strategic planning of the lean philosophy. Lean construction forces all parties to have a clear set of goals, benchmarks and objectives for the end process. Using the lean philosophy, the whole idea is to maximize the performance at every level for the customer. This includes employees, distributors and all managing parties. All of these groups are forced to work cohesively together and stresses production control throughout the entire project. Every unit of the project works together like a well-oiled machine, meaning that if one piece is loose, everything falls apart. Current construction models utilize the mass production mindset. Meaning that every job is allocated to just one group with little or no interaction. The lean focus causes all parties to work as one, thus maximizing time and allows more efficient planning and implantation. The lack of predictability is the main problem in standard construction procedure. Unpredictability results in lost time, waste and stress. The lean philosophy is centered around predictability and flow, thus eliminating most negative aspects. When thinking about implementing the lean philosophy, a company first has to look at the process of the project. The process, or the action, is directly correlated with the input, materials and information, that leads to the result. Learning how all three of these states go hand and hand is essential to a better outcome. In order to do this efficiently, a company first has to understand a customer’s ideas and input on the final product. Listening to the customer is essential in eliminating waste and utilizing the most out of the given time structure. On average, most waste is derived when a company’s vision is not aligned with the customers. Waste can be defined as, overproduction, excessive inventory, defects, incorrect processing or work and essentially, what is not of value to the customer. Value over waste is the ratio of efficiency, and in order to do that better, trimming of waste and increased customer communication is vital. Initially, before a project is undertaken, a comprehensive plan of action should be constructed alongside a team of individuals who will manage. The three states of action (process, input, final product) should be thoroughly established and broken down. Identifying the potential causes of waste and difference should also be measured. This is done by research and communication between groups. Due to the natural nature of humans, unpredictability is bound to happen. Using the lean philosophy however, variations of normal procedure should be spotted quickly and swiftly dealt with. What Exactly is Lean Construction? As discussed in prior sections, lean production is a philosophy, a methodology of thought and action. It is a system of ideas and ideologies that shape the way a project is handled and in turn helps the final product and the bottom line. There are many different schools, courses and tutorials available to businessmen interested in this modern approach of construction, but the overarching essential themes remain the same. The core values of beliefs of lean production are derived from a methodology known as lean production. Lean production is a simplistic, efficient philosophy that gained attention after automobile manufacturer Toyota implemented the method after the war. This method, Toyota Production System or TPS, became renowned due to its creator Engineer Ohno. Ohno developed the groundwork for a production system that allowed for greater customer satisfaction, fewer inventories and less waste. In the 1990s, a lean movement began as companies started to adapt some of the strategies of Ohno’s system, and in turn, the modern concept of lean production arose. How Does Lean Production Differ From Lean Construction? Simply put, lean production is what inspired lean construction but the two terms are not interchangeable. LC has also been inspired from other ideologies. Whereas lean production focuses on the decrease of time for turnover, achieved by the elimination of waste, LC also draws on social science, production management and complexity theory. The world of production is very different from construction. Generalities cannot be made between both disciplines. Where production tends to focus on mass volume, construction focuses more on the actual construction rather than the production of construction. The number of companies using lean construction methods has been steadily increasing with increased awareness. With the increase of learning tools, books, classes and seminars that have become available to business owners and companies, lean building has shown a substantial boom in the industry. Implantation in other countries such as the UK, Brazil, India and Germany has also been increasing. The start of the LC movement can be dated back to the formation of the ‘International Group for Lean Construction‘ (IGLC) in 1993. This can be seen as when the principles and ideologies that changed the manufacturing industry became intertwined with the design and construction industries. The IGLC paved the current interpretation by setting up the foundation of the theory. Furthermore, in 1997 the ‘Lean Construction Institute‘ (LCI) was formed. The LCI worked more on implantation of the system in assorted designs and projects than on the actual construction of the methodology. 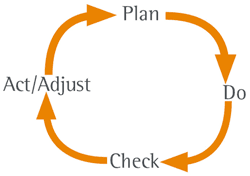 Control: Causing a chain reaction of events to conform to a given plan or structure. Directives: An order issued by a group leader or manager that directs workers on what or how to do a particular activity. Input: The combination of directives, prerequisites and resources required for a project. Output: The final product resulting from the given project. Prerequisites: Information or work done by others that is necessary for the project. Production Units: A group of workers in a specific area, such as electrical engineers who work on one aspect of the project, that relies on shared information, skills and materials. Productivity: The ratio of output produced by the resources used in its creation. Resources: Labor, tools, equipment and space, or essentially anything that is tangibly needed for a project. Materials and information are not considered resources but are what resources act on. Work Flow: The passage of information and materials through production units, which transfers the information downstream. Work Flow Control: Moving information and/or materials through production units in a controlled manner. A webpage of useful information by Michigan State University. The website includes a factsheet, and interviews with modern-day construction professionals. An online article from Power Magazine about the elimination of waste using this construction methodology. Lean Construction by Luis Alarcon: A seminal work in the philosophy of lean construction. Modern Construction: Lean Project Delivery and Integrated Practices is a textbook sized manual on the ins and outs of modern construction using the lean philosophy. Lean Culture for the Construction Industry: Building Responsible and Committed Project Teams is a great introductory book for companies interested in implementing lean practices into their current business. For those interested in the principles of lean construction The Simply Lean Pocket Guide for Construction offers practical advice and information presented in an easy to read formulaic matter. The End of Project Overruns: Lean and Beyond for Engineering, Procurement and Construction serves as a primer for those interested in the basic principles of lean construction.